Reminder: Please add or update your organization’s information on the Immunization Coalitions Network website if you haven’t already done so! The Hawaii Immunization Coalition and the Hawaii Public Health Institute are pleased to announce that they will be co-hosting the 2019 National Conference for Immunization Coalitions and Partnerships to be held at the Ala Moana Hotel from November 13–15, 2019. Be sure to mark your calendars for this opportunity to connect with immunization partners throughout the country. More information will be released later this summer. Stay tuned for updates at https://immunizehawaii.org or on social media (@immunizehawaii on Facebook, Twitter, and Instagram). In a unanimous decision on June 28, New York State’s highest court, the Court of Appeals, upheld the New York City (NYC) Board of Health’s 2013 mandate that all children ages 6–59 months attending city-regulated child care in school-based programs receive an annual influenza vaccination by December 31. The 2013 vaccination mandate had been struck down by two lower courts: first by the New York State Supreme Court and subsequently by the Appellate Division upon appeal. The New York State Court of Appeals reversed the lower courts’ decisions by finding in its June 28 decision, Garcia v. New York City Department of Health and Mental Hygiene, that the mandate was well within the Board’s authority to regulate for public health. ​The first two paragraphs of the NYC Department of Health and Mental Hygiene’s June 28 media release are reprinted below. Access the complete press release on the NYC Health Commissioner’s “Statements” web page. Bob Sears, MD, a California pediatrician noted for advocating ‘alternative’ vaccination schedules and discouraging parents from vaccinating, has been placed on probation by the Medical Board of California until he fulfills the requirements of a probationary period of 35 months. The first three paragraphs of an article in the LA Times are reprinted below. In a decision that could signal how California’s fierce vaccine debates will play out in the coming years, the Medical Board of California has ordered 35 months’ probation for Dr. Bob Sears, an Orange County pediatrician well-known for being sympathetic to parents opposed to vaccines. Sears can keep practicing medicine but will be required to take 40 hours of medical education courses a year, as well as an ethics class, and also be monitored by a fellow doctor. He also must notify all hospital and medical facilities where he practices of the order and is not allowed to supervise physician assistants or nurse practitioners. Two members of our National IZCoalitions Network received national awards this spring. In June, Amy Pisani, executive director, Vaccinate Your Family: the Next Generation of Every Child By Two, received the Association of Immunization Manager’s (AIM) Partnership Award. This award recognizes partners who have implemented a program, project, or service that delivers a valuable benefit, service, or resource that positively impacts all AIM members. In April, Elaine Darling, program manager, West Virginia Immunization Network, received CDC’s 2018 Childhood Immunization Champion Award. This is an annual award that recognizes individuals who make a significant contribution toward improving public health through their work in childhood immunization. Each year, one CDC Immunization Champion from each of the 50 states, 8 U.S. territories and freely associated states, and the District of Columbia may be honored. Congratulations to Amy and Elaine! As always, feel free to share such news with your colleagues via the IZCoalitions listserv. If you’re not a member of this closed discussion group and would like to join or know more about it, please email Teresa Anderson at tanderson@immunize.org. Vaccinate Your Family: the Next Generation of Every Child By Two developed the 2018 State of the ImmUnion document. This special report examines how strong the nation’s defenses are against vaccine-preventable diseases and what can be done to make our ImmUnion stronger and more resilient in the face of emerging health threats. The Indiana Immunization Coalition (IIC) has published an online toolkit about meningococcal B disease and vaccination titled Beware of B. This kit includes information and resources for healthcare providers; parents, teens, and young adults; and template materials for colleges, universities, and the media. Some of the information is Indiana-specific, but most can be used anywhere. IIC is willing to work with other organizations that might want to customize the toolkit with their logo and/or local information. Email director@vaccinateindiana.org​ if you are interested in adapting the toolkit. 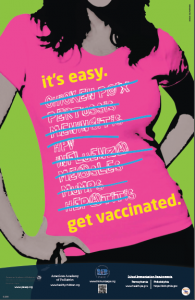 The Pennsylvania Immunization Coalition (PAIC) simplified and updated some previously developed posters that present immunization with simple, positive messages. The posters are available in English and Spanish. Again, please share the availability of such resources with your colleagues via the IZCoalitions listserv; no need to re-invent the wheel! If you’re not a member the listserv, please contact Teresa Anderson at tanderson@immunize.org. On June 20, the National Association of County & City Health Officials (NACCHO) published an article as part of its Stories from the Field series written by Tye Harlow, Colorado Children’s Immunization Coalition (CCIC), titled How’s My District Doing? Communicating Local Immunization Data to Colorado Legislators​. The first two paragraphs are reprinted below. As a statewide nonprofit organization, CCIC is dedicated to keeping Colorado kids healthy by building awareness for vaccination, educating health care providers, and advocating for policies that protect children with the goal of increasing immunization rates. In 2014, CCIC spearheaded the passage of House Bill 14-1288 which required licensed schools and child care centers to disclose their immunization rates upon request. In 2015, Colorado Board of Health rule changes took this legislation a step further by requiring licensed schools and child care centers to report their immunization and exemption rates annually to the Colorado Department of Public Health and Environment (CDPHE), and requiring CDPHE to make this information publicly available on its website. Despite our successes in 2014 and 2015, immunization and public health policy are continually threatened in Colorado, requiring resources and time to defend against threats to our already lenient immunization exemption policies. Additionally, legislators are increasingly exposed to vaccine misinformation from a small but vocal minority. In an effort to proactively educate and inform legislators of the importance of high immunization coverage rates at the local level, CCIC, with support from CDPHE, created tailored fact sheets for all 65 House Districts and 35 Senate Districts in Colorado. We began by mapping the newly-available 2016-2017 school immunization and exemption rates by House and Senate District using Tableau software, and then used the data to create visualizations with Adobe InDesign that communicate the level of risk for vaccine-preventable disease outbreaks by comparing coverage levels to Healthy People 2020 goals. Finally, we added messaging around the importance and safety of vaccination, community immunity, exemption policy, and recommendations for taking action. Access the complete article: How’s My District Doing? Communicating Local Immunization Data to Colorado Legislators. Thank you to Michelle Cantu, director, Infectious Disease & Immunization, NACCHO, for sharing this story with the IZCoalitions Network. IAC’s website for the National Immunization Coalitions Network at www.immunizationcoalitions.org is intended to be a one-stop shop for learning about immunization coalitions, their locations, missions, activities, newsletters, and how to engage with them. The website promotes the activities of immunization coalitions, offers resources of importance to the network, and provides a searchable online database of local, state, regional, national, and international immunization coalitions. Interested supporters of immunization can find contacts, resources, ideas, and volunteer opportunities. IAC has attempted to contact the approximately 200 coalitions listed on the former immunization coalitions website, and has received updated information from 129 immunization coalitions and nonprofit organizations; view their pages here. If your coalition, nonprofit, or professional association is not listed, or if your information needs updating, please email Teresa Anderson at tanderson@immunize.org. Also, if you know of a coalition in your state or territory that is not listed, please encourage the leaders to contact Teresa as well. Many immunization-related coalitions and nonprofit organizations offer free newsletters that help subscribers keep up with the fast-paced immunization world. IAC has collected information about a number of such publications on the Immunization Coalitions Network website at www.immunizationcoalitions.org/resources/newsletters. Check out these newsletters and consider subscribing to any of them. If you know of newsletters from coalitions, nonprofits, or professional associations to add to this page, please email Teresa Anderson tanderson@immunize.org. One of these newsletters is IAC’s own IAC Express. This free weekly electronic newsletter provides information on the latest vaccine recommendations and licensures; new and updated VISs, including translations; practical vaccination resources from IAC and other organizations; important journal articles; and conferences, meetings, and online continuing education opportunities. If you don’t already subscribe, you can do so by going to www.immunize.org/subscribe. Read back issues here. IAC maintains a Calendar of Events on its website for healthcare professionals at www.immunize.org/calendar. This is an easy way to find out about upcoming regional, state, and national conferences, and workshops, including those sponsored by coalitions. The calendar also includes special weeks of observances. If you have an immunization-related event that you would like your colleagues to know about via this Calendar of Events, email IAC at admin@immunize.org. The Advisory Committee on Immunization Practices (ACIP) met in Atlanta on June 20–21, 2018. During the meeting, votes were taken on influenza vaccine recommendations for the 2018–2019 season and guidance for the use of anthrax vaccine for post-exposure prophylaxis during a mass vaccination campaign. In addition, ACIP received preliminary estimates of 2017–2018 influenza vaccine effectiveness and discussed results of several studies related to influenza vaccine, including an early review of the relative effectiveness of cell-cultured vs. egg-based influenza vaccines, FDA monitoring of Guillain-Barre syndrome following influenza vaccination among Medicare beneficiaries, and a study to assess the risk of narcolepsy following receipt of 2009 H1N1 influenza vaccines. Other topics covered included possible expanded age indications (through age 45) for human papillomavirus (HPV) vaccine in the future, current mumps epidemiology in the United States and implementation of a third dose of MMR vaccine during outbreaks, an update on recombinant zoster vaccine supply and safety data, an overview of global National Immunization Technical Advisory Groups activities, and potential strategies for use of Japanese encephalitis vaccine. The Committee also heard extensive updates on pneumococcal disease incidence in the U.S., as well as information on pneumococcal vaccine safety and racial disparities in the vaccine’s use. Finally, the Committee received an update on the Pneumococcal Vaccine Workgroup’s ongoing review of the impact of ACIP’s 2014 recommendation of PCV13 for adults ≥65 years old. ACIP voted to approve the 2018–2019 influenza vaccine recommendations, which will be published in an upcoming MMWR. The Committee reaffirmed its core recommendation calling for annual influenza vaccination for all persons age 6 months and older who do not have contraindications. Additional updates to the influenza recommendations are shown below. Live attenuated influenza vaccine (LAIV)—New language approved by ACIP in February states “For the 2018–19 season, providers may choose to administer any licensed, age-appropriate influenza vaccine (IIV, RIV4, or LAIV4). LAIV4 is an option for those for whom it is otherwise appropriate.” In addition, LAIV4 is acceptable for persons with a history of egg allergy. Fluarix Quadrivalent Vaccine—Fluarix (GSK) is licensed for children ≥6 months of age. With this addition, there are now three vaccines (Fluarix and FluLaval [both GSK and both in 0.5 mL dose] and Fluzone [Sanofi, 0.25 mL dose]) licensed for use in children 6–35 months of age. All recommendations approved by ACIP are provisional until they are approved by the CDC director and published in MMWR. Presentation slides from the June meeting should be posted on the ACIP meeting information web page in the next 4–6 weeks. Subscribe to IAC Express, IAC’s free weekly newsletter. Read back issues here.